If your truck has become hard to steer or there is excessive vibration or shimmy of the front axle, there can be several sources of the problem. 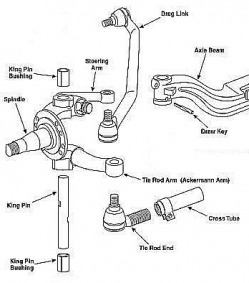 The first things to rule out are lack of lubrication and low pressure in the power steering system. Then you have to look at wear in the steering linkage. The problem could be as simple as worn or missing seals but most often it is a worn kingpin. The eye that holds the kingpin on each end of the axle will eventually wear and lose shape from repeated hard knocks and this will create play in the kingpin. The kingpin itself will also lose shape. The solution is re-bushing. At Plaza we bore the eye to a larger size and press fit a new sleeve to firmly grip a new kingpin. The procedure is commonly called “axle eye re-sleeving”. A similar procedure may have to be performed on the eyes of the spindle, also known as the steering knuckle. Again, the problem is that the kingpin is not properly fitting the hole in the spindle. Dayton Parts provides Plaza with all of the sleeves and kingpin repair kits necessary to fit the common sizes of truck axles and spindles used by any truck manufacturer. A steering linkage can also wear out at the tie rod ends which transmit the steering motion from one wheel to the other. The drag link which transmits steering motion from the steering gear box can also lose its original dimensions. The solution will be to replace the tie rod ends or drag link. If your truck has a major steering problem; if it almost seems like it changes lanes by itself even with a firm grip on the steering wheel; then you might have to look at the steering gear box itself. Plaza not only can replace a defective steering gear but can also rebuild yours to its original specifications. We can also repair or replace the hydraulic pump and hoses that bring power to your system. If your truck is subject to rough usage, the wear on your steering system is inevitable. It not only makes steering difficult but will cause abnormal wear of the tires. At Plaza we are familiar with all forms of tire wear. We will completely check out your steering system and advise you whether your tire wear is due to any of the above mechanical problems. We are able to adjust the “toe-in” of your wheels but, for a complete re-alignment we will send you to one of our favorite tire specialists.